The Kia Sedona proves that minivans can be just as exciting as crossovers. It has everything you need to get where you need to go: space, tech features, safety features, powerful performance capabilities and more! Today we're going to help you learn more by taking an in-depth look at the 2016 Kia Sedona in Houston TX. The Sedona is Kia's premium minivan option. It has seating for up to eight and if you need more cargo space than passenger seating on any particular day, you can take advantage of the available Slide-N-Stow third row of seats and you can even easily fold down the second row of seats as well. The Sedona makes it simple to bring any amount of cargo and friends or family along for the ride. The Sedona has available power-sliding anti-pinch doors that have built-in sensors that detect if an object is in the way. The Sedona has available ventilated seats that have three fan settings to cool you down even on the hottest days of the year. The Sedona has an available Surround View Monitor that uses four mounted cameras that give you a view of what is around your vehicle to make parking a breeze. The Kia Sedona isn't just spacious and full of features, it also has impressive performance capabilities. The Sedona comes with a 3.3-liter V6 engine that provides 276 horsepower and 248 pound-feet of torque. It is even able to tow up to 3,500 pounds, which makes it possible for you to bring along extra necessities. The Sedona offers the perfect balance of power and luxury. If you are interested in learning more about the 2016 Kia Sedona call or visit Archer Kia. We will be able to answer any further questions you might have. We can even help you schedule a test drive here in Houston TX. Come see if the Sedona is the perfect vehicle for your driving needs. 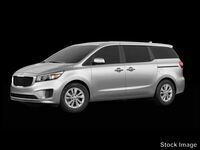 Interested in a 2016 Kia Sedona?